Capitol Police Captain Lonergan Speaks Into His Shoulder. props up his nose with a stiff sheet of paper. mine in the Penokee Hills scarf their faces. Perhaps he thinks this clear. They nod and cut a clear line toward the center. Mike Ellis, screws up his face, busts a gavel. We saw you, your face, your mouth moving. We have clear evidence. You were singing. No one saw the Governor pick up the phone. Just imagine his face as he answers the prank call. and take them into their own hands. the Ojibwe set up a harvest camp. paint their faces and chests green and gold. Lonergan? What do you call down there? And who calls it in to you? What has happened to Wisconsin? It has gone from being a beautiful progressive state to a fascist dictatorship within but a few seasons! 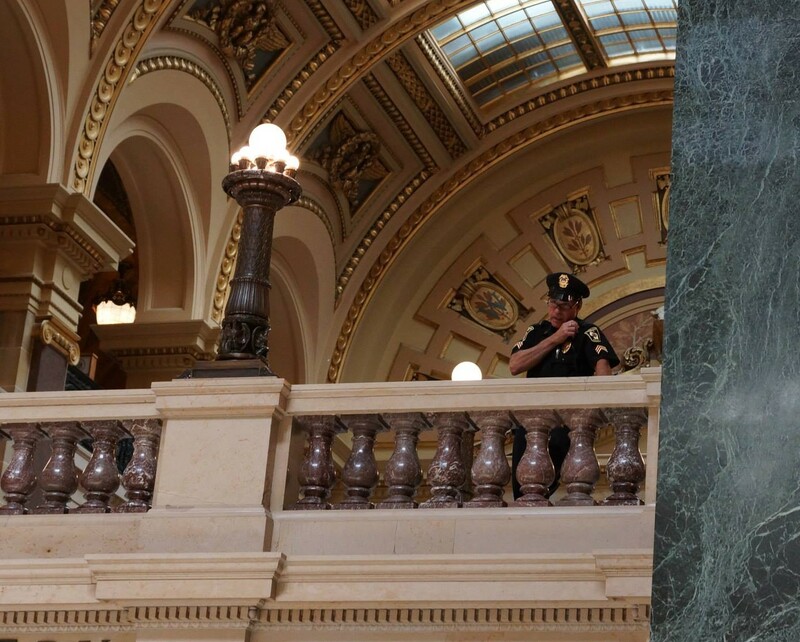 Now there is no singing in the capitol without a permit. A mine going in at the Penokee Hills that will result in the largest open pit mine in the word on the shores of sacred Lake Superior. Native Americans threatened to be evicted from public land that formerly belonged to them by machine gun carrying mercenaries imported from Arizona. Frack sand mines in the hundreds tearing apart the beautiful hills of Wisconsin and leaving environmental disaster zones. Hunting wolves with dogs that will result in either the wolves or dogs getting ripped to pieces while Hounders watch on calculating their take from WI taxpayers.Dogfighting is illegal in the rest of the country but not here! A DNR that does swat team executions of a baby deer named Giggles. A Natural Resources Board that purged all dissenting members so that they could resume the business of massacring the state’s wildlife more quietly and efficiently! A governor who has sought to impoverish and harm the state’s citizens by refusing healthcare for the poorest citizens (Obamacare) and taking away union’s collective bargaining rights. Walker enriches himself while draining the lifeblood from the state and it’s people. People of Wisconsin please gather your strength and fight against the dark forces that are sucking the life from your state! It must begin with you! We are here to support you. Perhaps you should arm yourselves with cloves of garlic, holy water, silver crosses, wooden stakes and mallets. May God be with you!